Kookaburras belong to a family of birds that are called Kingfishers. The Laughing Kookaburra is a thick-set bird with a large head, short neck, and medium length tail. The bill is long, broad, and somewhat flattened. The head is mostly white with a dark brown crown and a brown stripe through the eye. The breast is creamy white, the wings brown with blue mottling, the back brown and the tail rufous with fine darker brown banding and white edges. Males sport a small patch of blue-green feathers in the centre of the rump that is reduced or absent in the female. The eyes are dark brown. 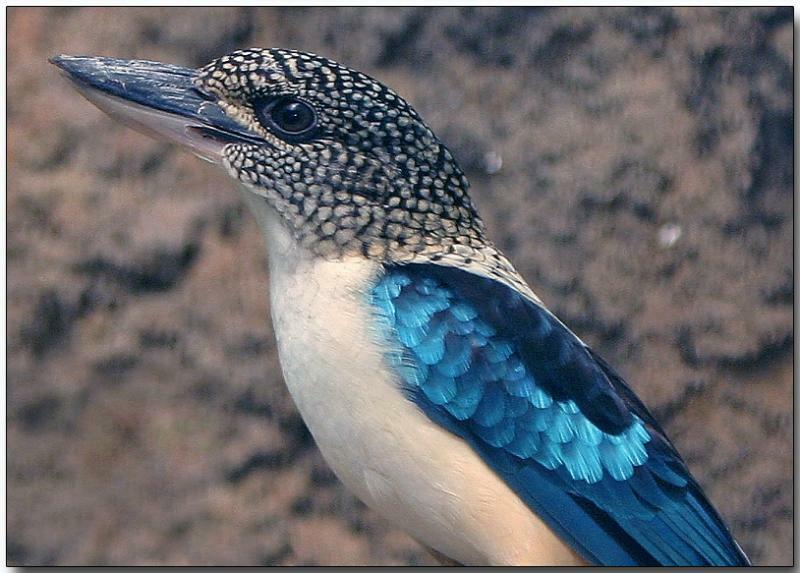 is one of the largest members of the kingfisher family. The Laughing Kookaburra is not really laughing when it makes its familiar call. and has been introduced into Western Australia, Tasmania, and Flinders and Kangaroo Islands. The Blue-winged kookaburra has a large blue patch on the wings. The head and chest are fluffy and covered with light coloured feathers, the rump and wings are coloured bright blue and it has some brown feathers above its dark blue tail . Has a large, cream-white head that is streaked brown. The rump and tail are also blue on the male, but the female has a reddish-brown barred tail. They have a very pointy long beak. Differences from Laughing Kookaburra are: blue rump, cream-white head and light eye colour. It is found in southern New Guinea and the wetter parts of northern Australia, across Queensland and the top part of Australia and down the coast of Western Australia. and has a preference for aquatic food such as fish, freshwater crayfish, frogs, waterworms and small crabs. is found mainly in New Guinea rainforests, living pairs rather than family groups . but over the past century it has been introduced and established in other parts of the continent and on off shore islands such as Tasmania. The Kookaburra is a member of the subfamily Daceloninae, the forest or wood kingfishers. 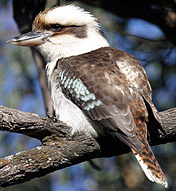 Laughing Kookaburras and Blue-winged Kookaburras live in woodlands and open forests. Kookaburras live in nearly all of Australia except the dry interior. They live in family groups of parents and their chicks. The chicks of varying ages help feed the new nestlings. They claim their territory with their laughing calls. Their nests are built in hollow branches of trees. Their claws, in comparison to other Birds of Prey, are not as strong. Their diet includes lizards, snakes, worms, earthworms and insects. Sometimes they eat rats and small birds. They also eat mice, fish, frogs and other small animals. their diet will consist almost entirely of these animals. then swooping down to seize their prey. Small prey are killed directly by the crushing action of the bill. Larger prey, including snakes of up to 1 meter in length, may be whacked repeatedly against a branch or dropped from a height until pulverized. Prey items include large insects, lizards, snakes, amphibians, small mammals, birds, and occasionally fish. In a Zoo Environment, they are fed commercially prepared "Bird of Prey mix" and dead, day-old chicks. including fish, small snakes, lizards, rodents, worms, beetles and other insects. Crickets, Grasshoppers, earthworms, centipedes, lizards and MEALWORMS. In an emergency - but only for 24hours max - you could substitute Dog/Cat food. or 2-3 mice per day and Youngster a little more. They drink very little (if any) as they tend to derive moisture from the food they eat. - taking up a post with a good view. its wings back, with beak ready to grab its dinner. to kill them and soften them up before they are eaten. It also serves to "tenderise" the meat of the prey. and will sometimes catch fish with plunging dives and, on occasion, raid suburban goldfish ponds. Prey is stunned by dropping from a height or whacking it against a branch before swallowing. against a rock until they are dead. (a bit like an owl does). If they get stressed they will regurgitate their meal - even hours later. they end up poisoning the animals which usually feed on those pests. they absorb the pesticide chemicals and store them in their fat. high concentrations of chemicals may flow into the blood. The result can be reproductive losses or even death. allow extra time for the food to get as far down as the crop. Scissor-type of tweezers are ideal for feeding like this to prevent getting bitten. This will help the food slide down the throat easier. Must be housed separately - if put in with other birds esp. smaller ones - they may eat them. and may not "LAUGH" unless with or near their own breed. The need a long Aviary, as they need lots of Flying space. All four species are listed as being of 'least concern'. which sounds like the laughing call the birds make. The aborigines also believed that any child who insulted a kookaburra would grow an extra slanting tooth. the sun, in the morning and to put it out at night. Kookaburras have short, thick bodies, large heads and long bills. Their feathers are brown, black or white. There are blue patches on some of the feathers. Males and females look similar. most often in the early morning and just before dark. The calls let other Kookaburras know where each one lives. 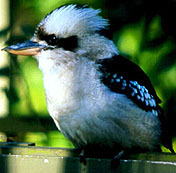 The Laughing Kookaburra and the Blue-winged Kookaburra live in family groups. One will make the chuckling sound that is the start of the call. so they laugh in chorus. The most famous feature of the species is its loud, boisterous "laugh", a repeated "kook-kook-kook-ka-ka-ka" call that rises and falls in volume as family members join in to form a raucous chorus. The chuckling voice that gives this species its name is a common and familiar sound throughout the bird's range. The loud 'koo-koo-koo-koo-koo-kaa-kaa-kaa' is often sung in a chorus with other individuals. which is normally given when accompanied by other members of its family group. They usually only have one clutch per year. Kookaburras begin their breeding cycle in October, the Australian springtime. Courtship includes vocalizations and conspicuous display flights high over the treetops. Once a pair selects a breeding territory they begin nest construction. Both male and female participate in excavating a nest burrow. In some parts of Australia, Termites construct enormous clay mound nests high in Acacia trees. These arboreal termite mounds seem to be the preferred nest site for Kookaburras and other kingfisher species. They will also utilize hollow trees, earthen banks, and even holes in walls when better sites are unavailable. Burrows may be two feet deep with an entrance hole four inches in diameter. about the size of a Bantam chicken egg, in a hole in a tree. or in a burrow excavated in an arboreal (tree-dwelling) termite mound. During the 25- to 29-day incubation. Both parents feed their chicks. Both sexes share the incubation duties and both care for the young. Incubation begins with the first egg laid - of up to four. Feeding of young is carried out by all members of the group. but the parents continue to feed them for another 40 days. Laughing Kookaburras are believed to pair for life and have an unusual parenting behaviour. Every bird in the group shares all parenting duties. the next clutch of babies. This behaviour contrasts dramatically with the majority of birds who leave the nest once they are fledged to search for territory and mates of their own. When a Kookaburra family-system of chick rearing has been established it is usual for a second clutch of chicks to be raised in one season. In this instance, the offspring of prior clutches will take over the raising of the first brood of the season while the parents attend to the second. breast used to transfer body heat to incubate the eggs. Most helpers are males who assist with nesting duties as well as territory defence. If a parent dies often a helper will take the place of the missing mate. Hatchlings emerge blind and practically naked. The eyes may not open completely until the bird is nearly three weeks old. Parents feed the young a diet consisting primarily of insects + poss. mealworms. as they remain within the burrow for a full month. When they finally are coaxed from the nest they are already able to fly. The parents continue to feed the fledglings for several weeks after they emerge from the nest. The birds will remain together as a family group until the next breeding season begins. You will know your Kookaburra is still under 3 months old if it's beak is still ALL BLACK.